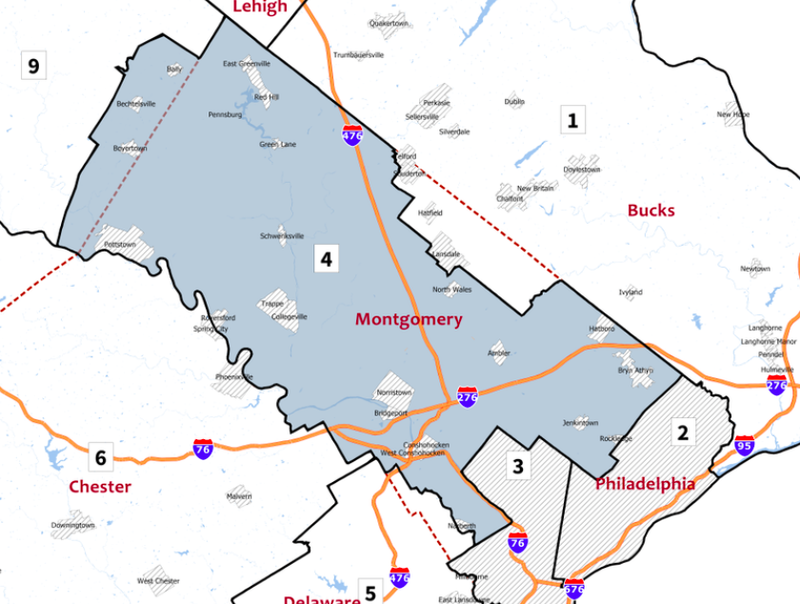 Welcome to the PA’s new, Fourth Congressional District….Montgomery County! Springfield Township used to be in Pennsylvania’s 13th Congressional District, now we’re in the 4th. The redistricting affects only US House of Representatives—State and local districts remain the same. The Senate race with our own Bob Casey remains statewide. The ‘new’ 4th district is, for the most part, all of Montgomery County. Brendan Boyle, our current Congressperson, has chosen to run for reelection in the new 2nd district. But we now have the chance to add another Democrat to the US Congress! Madeleine Dean! PA’s electorate is roughly divided equally between Democrats and Republicans. However, with the old, Republican drawn congressional district map, Republicans held 13 of PA’s 18 seats in the US House of Representatives. Montgomery County was split between 5 congressional districts. This past January, the old congressional district map was ruled to be in violation of the PA Constitution by the PA Supreme Court — that the district drawn by Republicans had been purposely created to disenfranchise Democratic voters. And, after not too little wrangling, the new map was drawn by Stanford University law professor and redistricting expert Nathaniel Persily. For a detailed analysis, here’s an article from the Public Interest Law Center — Pennsylvania Redistricting Lawsuit. And if you’re really curious, here’s a awesome read from Wired Magazine — The Geeks Who Put A Stop to Pennsylvania’s Partisan Gerrymandering.